Organ loft view of yesterday's gig at Wymondham Abbey by 2010 Mercury Music Prize nominees and musical hot property the Kit Downes Trio. All three young musicians are graduates of the Royal Academy of Music and pianist/composer Kit Downes acknowledges jazz musicians including Bill Frisell and Skip James among his influences as well as Béla Bartók. At last night's concert Keith Jarrett and Bill Evans were also there in the mix, at which point paths converge as György Ligeti cited Evans as an influence on his Etudes for piano. Last night's concert was the first live music that I have heard since my recent illness; it sounded quite magnificent and I can recommend hospitalisation as a very effective form of ear-candling. Wymondham Abbey, which dates from the 12th century, is now a High Anglican church and the exuberant reredos in the former Benedictine Abbey was designed in 1913 by the Gothic Revival architect Sir Ninian Comper. 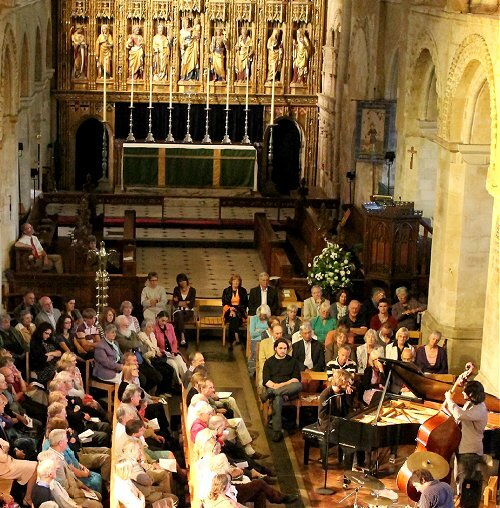 Wymondham Music Festival continues until July 10. Now read the peerless Patrick Leigh Fermor evoking another great Abbey where columns of plainsong soared upwards. Photo credit Anna Meek, eagle eyed readers may spot me in the audience. Report broken links, missing images and errors to - overgrownpath at hotmail dot co dot uk Also on Facebook and Twitter .